Ha! I didn't do the "numbered" UFO quilt, but I finished two BOM quilts in March! There are so many great "finishes" this month, I'll save my own until TGIFF (Thank Goodness it's Finally Finished) Friday. The first finish for March came in when the month was little more than half over! 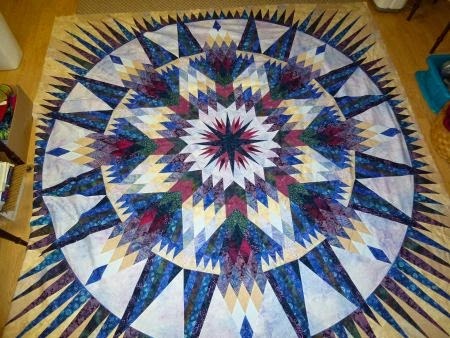 Kerry sent a photo of her Star Fusion quilt, started at Road to California in January. I love the colors, Kerry! Kerry blogged about this quilt here at Kerry's Quilting. 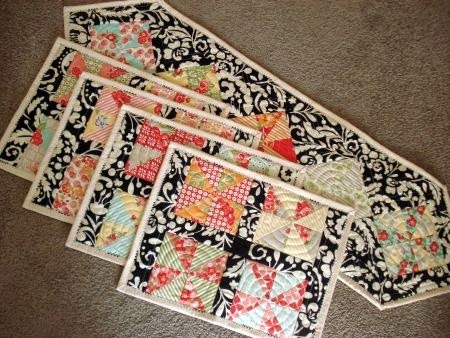 Sue came in right behind Kerry with this cute set of placemats and a table runner in "Marmalade" from Bonnie & Camille. The background really sets of the soft colors in this collection, Sue! 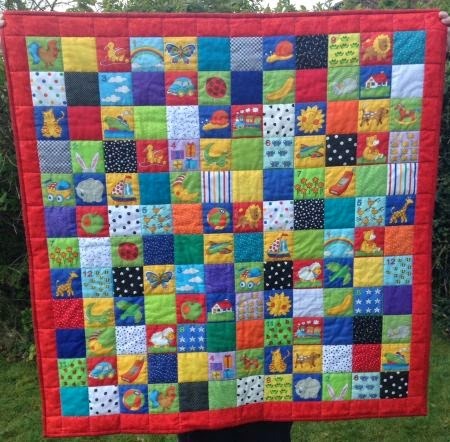 Take a look at Sue's Quilty Bits & Bobs here for the whole story. I always look forward to seeing what "K" name Sandi comes up with each month. Here is "Konstituent." I know a group of high school rodeo club members who would just love this one! Sandi blogs at KwiltnKats, take a look here for more info on this fun kwilt. One of our newest "finishers," Katie, is going great guns with her UFO finishes this year. 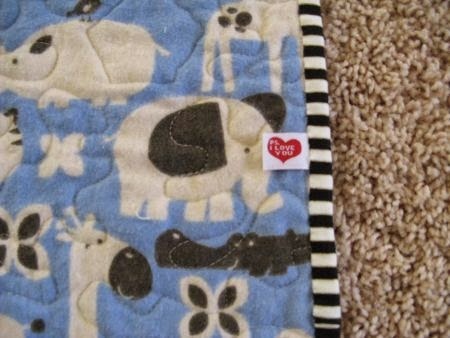 She says she will donate this cute baby quilt -- I have to show you more than one photo, it's so cute! Clearly, Katie has caught my addiction to striped binding. Isn't this little "PS I Love You" label adorable? Jackie also made a quilt to donate. 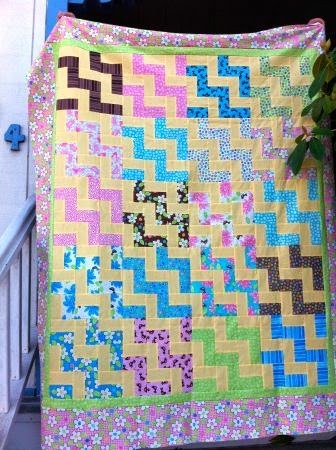 It's a 'Match the pairs' quilt and will be donated to Project Linus. Lyn finished a long-time UFO this month. I want you to go to her blog, What a Hoot, because she has a great method of keeping projects organized. Plus she has wonderful gratuitous cat photos! She reports "Holiday Tidings" has been a UFO since 2008. Congratulation on this finish, Lyn! Here is this month's UFO. It isn't grand or big, but it is finished and made entirely by hand. My family was on vacation in the summer of 2011 with my parents. I watched my Mom spend her downtime working on a hand project, while I had nothing to work on. So when she needed to run to the local quilt shop, I jumped at the chance. I bought a charm pack, thread, and a pack of needles. 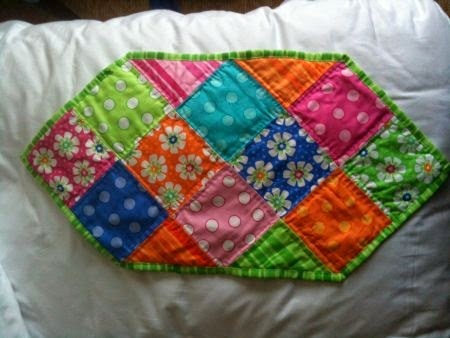 I started making this little table runner, but never finished it. So I packed it up for this week's vacation, and finished it. So right, Joy! Finished is better than big! I think it's so sweet. Betsy makes me laugh out loud with the name of her March UFO. 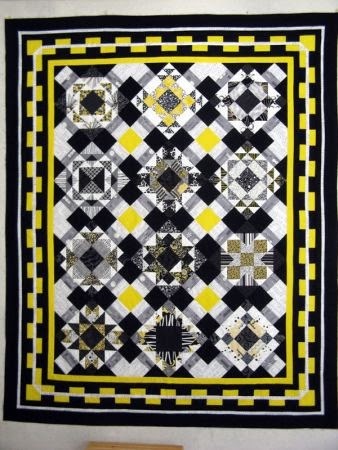 Remember the Y2K quilts we all started in 1999? Well, here is "YsoLate." 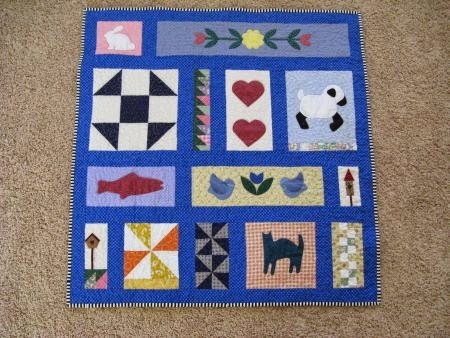 This one isn't using all 2000 of the charm squares that I collected from various people via an AOL quilt forum. but it uses some of them....finally. Wow, I think we should all give a bow to Mary for this finish! Mary says, "This top made from Judy Niemeyer's wonderful Amazon Star pattern is finally ready to send to the quilter after 2 years of work! 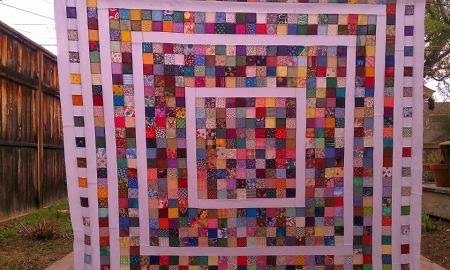 Judy's patterns are awesome both in their beauty and in their number of pieces per quilt ;-) This one is king size." Wow. Just. Wow. 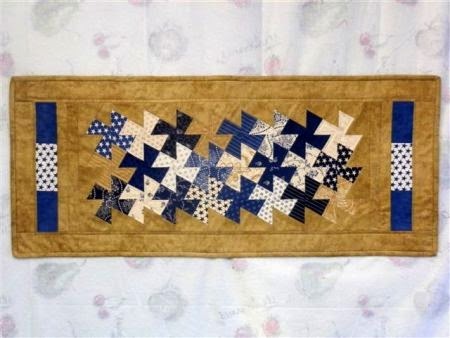 I hope you'll send another photo when it's been quilted, I'd love to see what your quilter does with this beauty, Mary! Noela gets extra credit this month for not only finishing her UFO at quilt retreat, but attaching a label as well! 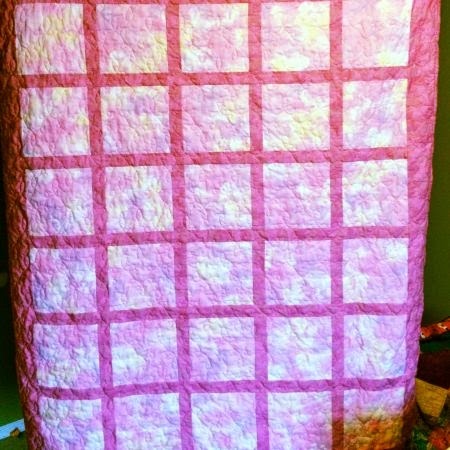 I did finish a quilt this month, although it was not officially my March UFO. My father has been in the hospital most of the past two months, after breaking his hip. I decided to make one of my lap quilts, since the rehab places are often too cold for him. He is a postcard collector/seller and I found this postcard fabric in my stash, so the hard work was done for me - deciding what style to make! Donna has two finishes to share this month. The first is so appropriate, as it may officially be "Spring," but the weather didn't get the memo! And she has such a sweet story behind this quilt. While cleaning and organizing my sewing space I found a whole pattern cut out for a copy of a lap quilt I had made my Aunt Mary Anne when she went into a nursing home. Not sure why I had another one already cut out but her quilt was not found amongst her possessions when she passed. I finished it this month so that I can remember her although that happens almost daily since she asked that I get her Pfaff when she could no longer use it. 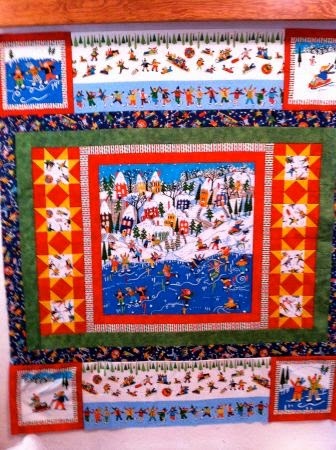 And remember Donna's "Streaks of Winter Sunshine" flannel quilt from last month's UFO Parade? She reports she tied it and has been sleeping under it "nice and toasty!" 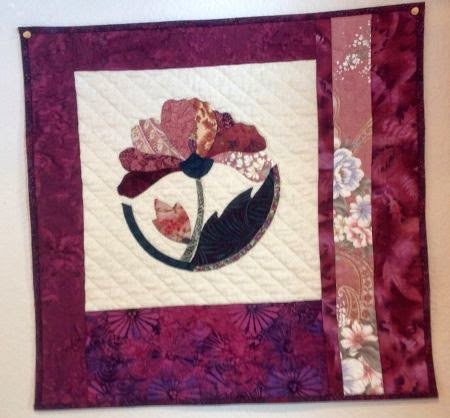 Carol Anne finished this lovely hand applique'd and hand quilted wall hanging. I so admire those who do hand work like this! 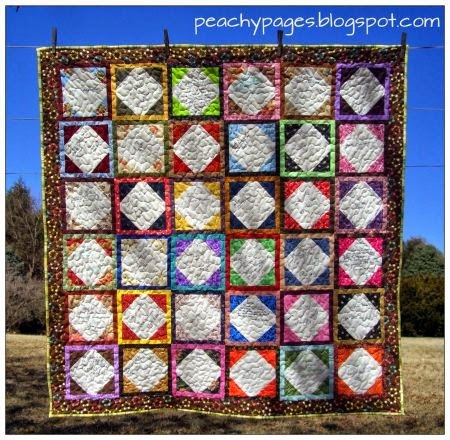 Every time I see one of these quilts finished, I want to drop everything and go work on mine! Here is Debra's "Celtic Sunset." 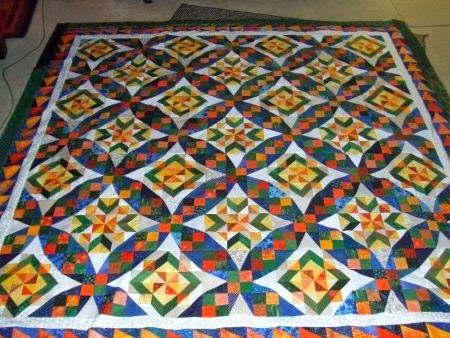 It was Bonnie Hunter's 2013 Mystery Quilt -- as Debra says, who would have thought blue, orange, green and yellow would result in such a gorgeous quilt? Congratulations on a big finish, Debra! Gill calls her March finish "a salvage operation." I so admire you, Gill, because I think this project would have wound up in the "recycle for cat beds" bin if it had been mine! 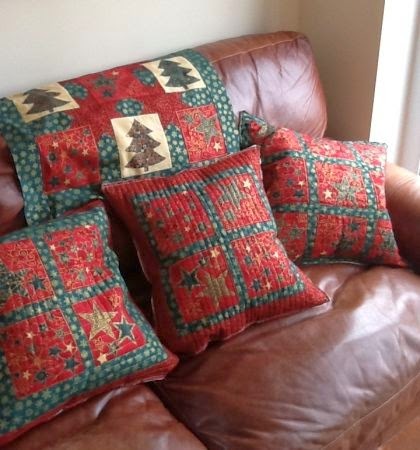 Here is my Number 4 finish - Christmas cushions and table cloth. This was meant to be a Christmas quilt and it has been on the back burner for a while after getting bogged down in fussy cutting, over estimating how much fabric I had available and cutting strips too wide etc. Coming back to it was especially hard as it was cut and started at a different experience level - so now I realise why it could not come together: as the accuracy of cutting was so poor, but due to the design it was impossible to recut very much because I would lose half the pictures! So some unpicking and rejigging followed and now it is salvaged as cushions and a table cloth! And here is her "save." Those pillows look so perfect on your leather couch, Gill. Good save! Nancy H. not only got caught up with her finishes this month, I think she's ahead! Nancy sent in three finishes this month! 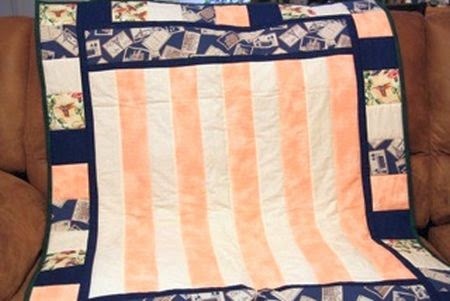 First, here is a speedy start-to-finish quilt for a foster daughter. 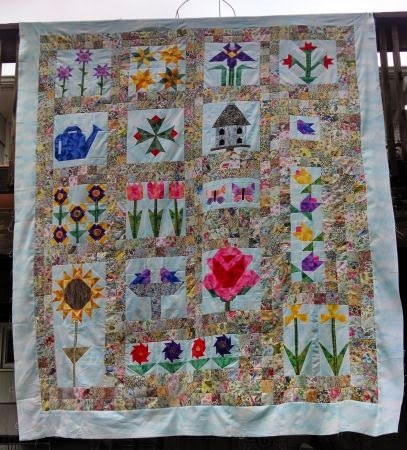 Go to Nancy's blog, My Love of Fabric, to read the touching story behind this quilt. 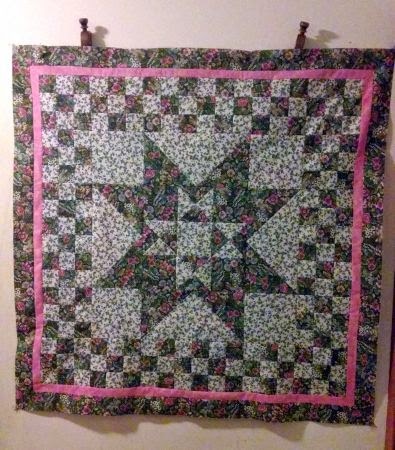 Be sure to notice her husband bound this quilt! And her March UFO. 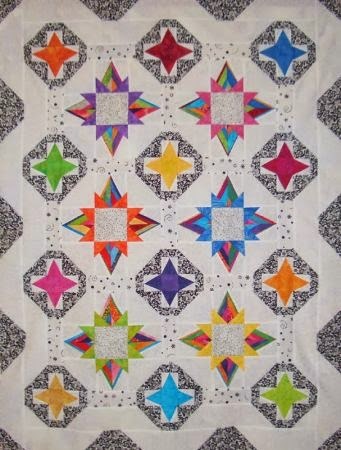 Look closely at the block in this quilt, it look easy but to me it looks easy to confuse the fabric layout! Nancy says she did more than a bit of ripping and re-sewing on this one! And here's a last-minute entry, this one from Elisa at Yarn Tails. 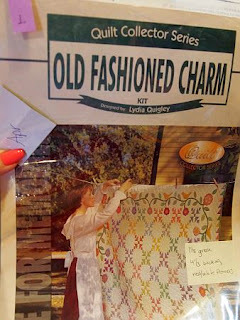 She tells us "I bought the fabric for this quilted bag almost a year ago, during my first ever Quilt Run. And then it languished until the UFO challenge. So happy to have it done!" 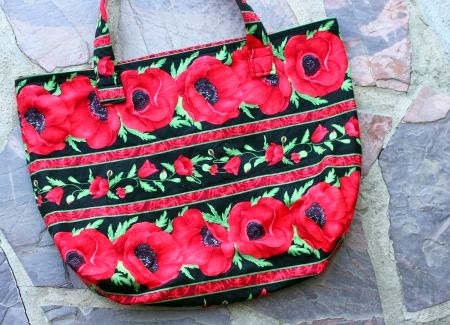 Very cute, Elisa, and you know a knitter can't have too many bags! Oops, one more at the last minute! This from Heather, details on her blog here. TWO giveaways for the parade this month. If you remember, I offered my April UFO kit to someone who wanted to finish it. It includes the pattern, templates, and 30s repro fabrics for the pieced blocks. I have to laugh at the comments, they were about evenly divided into "I want it" and "I'd never finish it, either!" 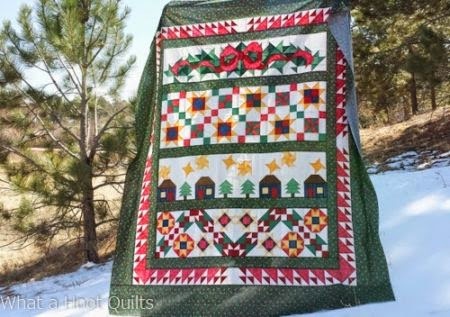 Diane, I don't have an email address for you, so please email me at AuntMarti at 52Quilts dot com with your postal address and I'll send "Old Fashioned Charm" to you right away! There were 20 (!) finished UFOs this month. And the RNG chose Kerry! I'm so pleased, because Kerry has been a long-time finisher but is a first-time winner! I have some lovely Michael Miller Cotton Couture solids I think you'll like, Kerry! Congratulations, finishers! Remember, you can join the UFO challenge at any time, go to this post to see how -- hoping to see your finish here next month! Thanks for adding my finish last minute! Next month, I'll try to do better!! Those are all wonderful finishes. Such great inspiration!!! Oh dear #1. I was hoping that one would come later in the year. Not that I do not want to do it. I do. It is just that it has a lot of pieces. So many lovely finishes - hard to pick only one favourite - but that amazon star has been a long time favourite and I so admire anyone who makes it. I will need a coffee and some time to go look at all the related stories - good job Marti - again! What a spectacular group of projects this month. March must have been a busy month around the world - so many finishes. They're all so lovely too, well done everyone! I had such fun going through these today! "YsoLate" and a husband binding. . . such cultural richness in the month's group and cleverness in recouping from a seeming loss on the Christmas quilt ufo. Thank you for taking the time to put this together, Marti!